If you are like most people who are redecorating one or more rooms of your home, you understandably may think about decorating with various common materials. This may include leather and numerous blends of cotton, polyester and other expected materials. Decorating with cowhide rugs does not always come to mind immediately as you explore decorative materials and statement pieces to add to your rooms. However, there are four essential reasons why you should give cowhide serious consideration before you finalize your home decorating plans. You may shop for furniture and accessories at many of the same local stores as your neighbors, and you likewise may visit the same websites. While there are numerous products in these stores to consider, your social group may understandably be drawn to similar pieces. Your home décor should be appealing to you, and it also should represent your individuality. A great way to add character to your space that sets it apart from your neighbors’ homes is to bring a cowhide rug into one or more rooms. 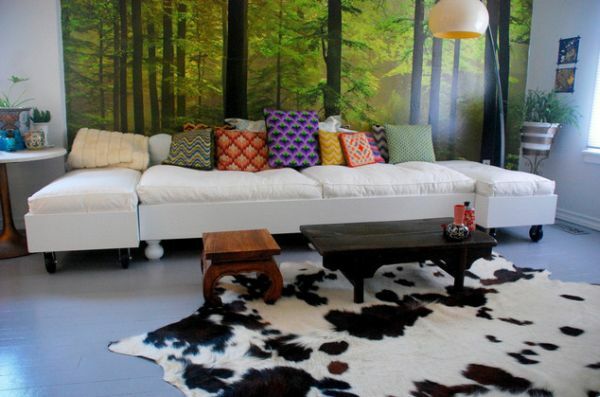 Cowhide is associated with rustic home décor, such as a country theme. However, this material has substantially more versatility in terms of complementary styles than you may think. Consider that a bold rug with black and white specks may look stunning in a home with a modern or contemporary style. A rug with gentle marbling featuring lighter and darker grey or sable hues may look perfect as an accent piece with traditional décor. With a huge spectrum of natural colors featured on cowhide and with varying degrees of spotting, mottling and marbling, the design possibilities are extensive. Regardless of your room’s style, this is a material worth considering. When decorating with cowhide rugs, you are not restricted to using them only on your floor space. These rugs are perfect for visually breaking up large floor areas and adding softness to hard floors. However, they can also be used as a large wall covering or casually draped over a sitting chair or sofa. This versatility enables you to be flexible about how you take advantage of the benefits of cowhide in your home décor. While there are many materials that you can bring into your home and sprawl on your sofa, floor or other areas, it makes sense to choose materials that will continue to look great for many years. Cowhide naturally is incredibly durable and resistant to staining. Even if you choose to place it in a busy area of your home, such as in your family room, it will continue to look amazing despite heavy use. This material is so hardwearing that it is ideal for homes with children or in areas that are commonly used for entertaining. Cowhide is easy to care for as well, making it more functional for use in home décor than other materials that you may be considering. When selecting materials to use in your home décor, style and colors may understandably be top criteria to focus on. However, versatility, individuality and durability are also critical points that deserve your attention. By comparing cowhide against some of the other materials that are at the top of your list of options, you may decide that this material deserves your full attention as you finalize your decorating plans. Visit www.citycows.co.uk for more information.